Founded in 2015, owner Connaire McGreevy is a craft beer aficionado and businessman who was inspired to launch his own brewery after he travelled and visited craft brewers and bars all over the world, seeing first-hand how exciting the industry can be. He channelled his passion and research to produce the some of the finest artisan beers in the country, catering to the growing thirst for local brews. 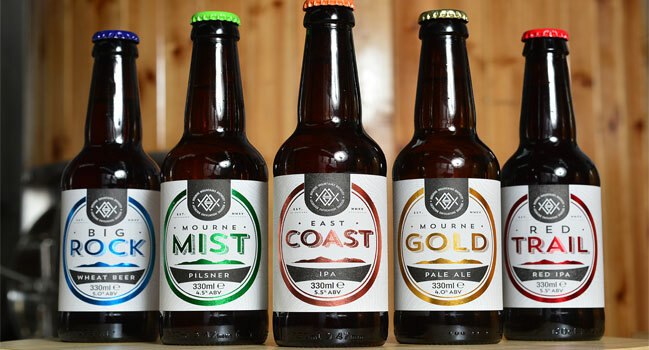 Mourne Mountains Brewery has grown to become a major part of Northern Ireland’s blossoming craft beer sector. The brewery is also inspired by the legend of ‘Slángha’, an ancient figure who travelled over from Greece and was one of the first people to produce beer using the water from the Mournes. Here then, is a homegrown brewery inspired by one of our areas of outstanding natural beauty, that’s tapping into some outstanding natural ingredients too. Mourne Gold pale ale – The grist of Mourne Gold combines lager malt with 10% wheat malt, producing a very pale ale. Continental Brewers Gold hops give a fresh and fruity aroma, making this a beer worthy of its legendary past. Mourne Mist pilsner – Soft brewing water combined with biscuity barley malt and the classic Bohemian hop variety, Saaz, for a floral aroma and an earthy bitterness. East Coast IPA – Inspired by West Coast IPA brews from the USA, this shows that a beer brewed on the East Coast can be just as hoppy. Citrus and pine aromas give way to juicy malt and resinous hop flavours, with an assertive bitter finish. Big Rock wheat beer – Special yeast is used to produce fruity aromas which are balanced by spicy German Northern Brewer hops. Malt starts to come through in the flavour of the beer, with more spicy hop and a hint of clove rock from the yeast. Caramalt and crystal malt really shine in the finish making this a landmark of a beer. Red Trail red IPA – This beer combines the finest specialty Caramalt and Crystal malts with Roasted Barley in the grist. It is generously hopped for flavour and aroma, with a long dry finish. Mourne Mountains Brewery also produces a number of seasonal, limited edition beers throughout the year, so keep an eye out for those. Red Trail red IPA won two stars at the Great Taste Awards 2016, the only beer from Northern Ireland to achieve that accolade in 2016. East Coast IPA won a silver medal at the 2016 Alltech Dublin Craft Beer Cup, the only NI beer to be recognised with an award that year.